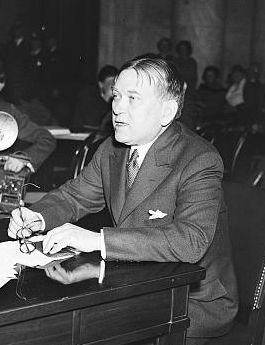 Over at PopMatters (September 18, 2014), Iain Ellis, who teaches English at the University of Kansas, devoted a column to the Scopes trial, emphasizing the role of the journalist and critic H. L. Mencken—indeed, the column is entitled, “Mr. Mencken Went to Dayton and the Culture Wars Began.” Ellis is generally reliable, although he may be paying too much heed to Mencken’s own, sometimes self-aggrandizing, tales of his involvement in the case. For example, Ellis credits Mencken with recruiting Darrow for the defense, probably on Mencken’s authority. But as Terry Teachout notes in his The Skeptic: A Life of H. L. Mencken (2003), Mencken offered no such claim in the definitive account of the Scopes trial that he included in his posthumously published Thirty-Five Years of Newspaper Work, instead crediting Joseph Hergesheimer. Darrow, for his part, wrote in The Story of My Life (1932) that he volunteered for the defense when he heard that Bryan would join the prosecution—although there’s no reason to suppose that Darrow was immune from the temptation to overstate his alacrity to involve himself in the case, for all that. Anyhow, I don’t propose to check every little fact in Ellis’s column. Rather, I want to draw attention to a lacuna in it. Ellis concludes, “Therefore, though Scopes was convicted for his misdemeanor, the country and the world—not only Dayton and Tennessee—were in the process exposed to a case where ‘sense’, according to the reporter [Mencken], ‘achieved a great victory.’” Well, yes, Scopes was convicted, after the jury deliberated for all of nine minutes, and the court fixed the fine at $100. Invited by the judge to comment, Scopes spoke for the first time during the trial, saying, “Your honor, I feel that I have been convicted of violating an unjust statute. I will continue in the future, as I have in the past, to oppose this law in any way I can. Any other action would be in violation of my ideal of academic freedom—that is, to teach the truth as guaranteed in our constitution, of personal and religious freedom. I think the fine is unjust.” Both the ACLU and William Jennings Bryan, the star of the prosecution team, offered to pay the fine for Scopes. But (and here’s the lacuna) the conviction was overturned on appeal! All along, the defense team expected to lose the case in the small-town court. The plan was to appeal the verdict and to win a victory at the appellate level. But it was not to be. Although the conviction was overturned, it was not the victory that the defense team sought. Why? Recall that Clarence Darrow, in a legally unusual but highly mediagenic stunt, called Bryan to the stand to testify about the Bible. Darrow’s harsh treatment of Bryan on the stand attracted a lot of criticism, especially after Bryan died five days after the close of the trial. As a result, Forrest Bailey of the ACLU told John Randolph Neal Jr. (1876–1959) that he should take the lead in appealing the verdict. A Tennessee lawyer, Neal was involved with the case from the get-go, having offered to defend Scopes when he was indicted. But he was notoriously disheveled and erratic. When he taught at the University of Tennessee’s law school, he was often late or absent from class. When he arrived, he would often rant about current affairs rather than discuss the law. Fortunately for his students, he tended to give them good grades without even reading their examinations. Larson also observes that Neal “missed the deadline for filing the bill of exceptions with the state supreme court,” thus precluding “the defense from appealing any issues relating to the conduct of the trial—including the ruling on expert testimony.” According to the state’s motion to strike out the “so-called bill of exceptions,” Neal would have had to file the bill within thirty days of the trial, i.e., by August 20, 1925, but it wasn’t filed until September 16, 1925. Neal’s submission included a document from the court, signed by Judge Raulston, granting “thirty (30) days from July 21st, 1925, in which to prepare, perfect, and file his bill of exceptions”; the state’s motion observes that the typewritten “thirty (30) days” was marked out and “sixty (60) days” was substituted in pen and ink. As far as I can tell, nobody knew then or knows now who amended the document, but the state argued, in effect, that the deadline was the deadline regardless, and the Tennessee Supreme Court agreed. Undiscouraged, Neal submitted the scientific expert testimony unheard in the trial court to the appellate court anyhow. Part 2 will discuss what happened next.